I have read quite a few of Erica's books but I think this is my favourite so far! I love Max and Bryony, the way they talk and carry on had me laughing a lot. I have been looking forward to Max's story, he always intrigued me in the other books. I love Bryony, she is so different from what you'd expect a Regency lady to be like, even stronger than her sisters. They are perfect for each other, and I totally recommend this book! I was given an advanced copy so that I could give my honest review. I love Erica's books. 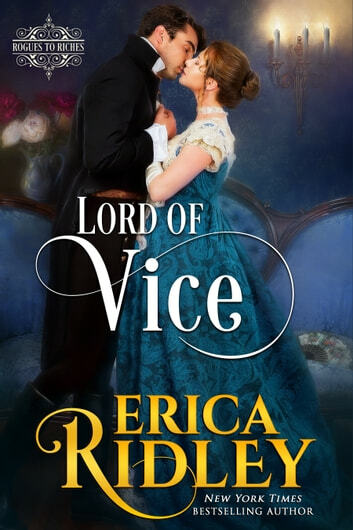 I was one of Erica's to ask me to read and review her books. Thank you! This is the end of this series to start another but I think some will pop in the future! Max owns a club, Cloven Hoof for gentlemen to talk and rest. NO WOMEN! Bryony is the youngest daughter in the family in a Baron. She can works with numbers. Max doesn't know she has loaned to him. Heath is her brother and helps her to go around in men's clothes! She is helping him or she thinks so. She loves him. Max won't admit he loves her when when he has problems, like find a better job for his sister. The top of the pot blew on that one! They just go around in opposites directions. I would recommend for you to read this story. Give this book a chance. You will find you may need tissues or walking away, to come back. You won't regret your Reading! Having read all the other Rogues to Riches novels, I was happy to read Bryony and Max's story, as references to both these characters had been woven into previous books in the series. Max is a self-made man and despite his background, he is nevertheless trustworthy and loyal, never loses control and always does the right thing by the people who count in his life. Bryony is the youngest of the Grenville siblings and to some degree the wildest. She has also been gifted with an amazing business brain, much to her mother's consternation. The attraction between Max and Bryony is inevitable, but crossing the great divide between nobility and commoners is a no-go area. Max has no intention of crossing that line but doesn't count on Bryony's determination. Apart from encountering a man who is willing to treat her as an equal, Bryony finds in Max a man she can respect, for whom she is willing to give up her independence. Unfortunately, there is Lady Grenville to take into account, and Bryony knows that winning her mother's approval will be impossible. Apart from the forbidden romance in this book, it also brings out the strong relationship between the Grenville siblings, who have all found love and happiness, in spite of their mother's interference. I thoroughly enjoyed this book, the build-up of the relationship between Max and Bryony, as well as the way in which barriers to their relationship came tumbling down. I received a copy of this book through NetGalley and this is my honest and voluntary review. This is Bryony and Max' story. Bryony is a hoydan. She is definitely not a rule follower. Her parents want her to marry and are ready to choose a husband for her. He must be titled and a match that will be adventageous. In other words, boring. Byrony has been secretly making her own way. She has been investing her pin money and amassed a good sum of money. But she cashed that in and secretly donated it to the school her sister runs. The only investments she has left are her portion of the ownership of The Cloven Hoof and the land/building that house it. Max came from nothing. His mother and father worked themselves to death so their children could have more than they did. When his dad died, Max went to work on the dock in his place. He started the Cloven Hoof as a place where not just the elite and titled could go. But he needed an investor in order to do it. Now that he has succeeded, he wants nothing more than to own everything outright. The business will be all his when the contract expires shortly but he still needs to buy out the owner of the building/property. The person is anonymous so he goes to the person who set up the deal, who happens to be Byrony's brother. He tells him he wants to buy out the owner and makes a high offer. Byrony is concerned and thinks it's a bad business decision. So she sneeks into the club after hours to see what is up. But Max finds her. Over time, they strike up a friendship and the attraction grows. But how can a gaming hell owner and untitled son of a dock worker marry the daughter of a titled man? Loved this book and the series. Can't wait for the next one. Rulers of Vice and Investments! Rulers of Vice and Investments! Strong characters with high ambitions. Bryony and Maxwell's story was worth the wait! Bryony is unsure in her appearance, due to mom's criticism, yet masterful in her business dealings. Max is unsure of himself in personal relationships, due to childhood poverty and his new wealth (good digger.Together they'd be dynamic! Loved the characters, witty banter and sparks between the leads. Powerful ending to the series! Voluntarily read ARC for honest review.